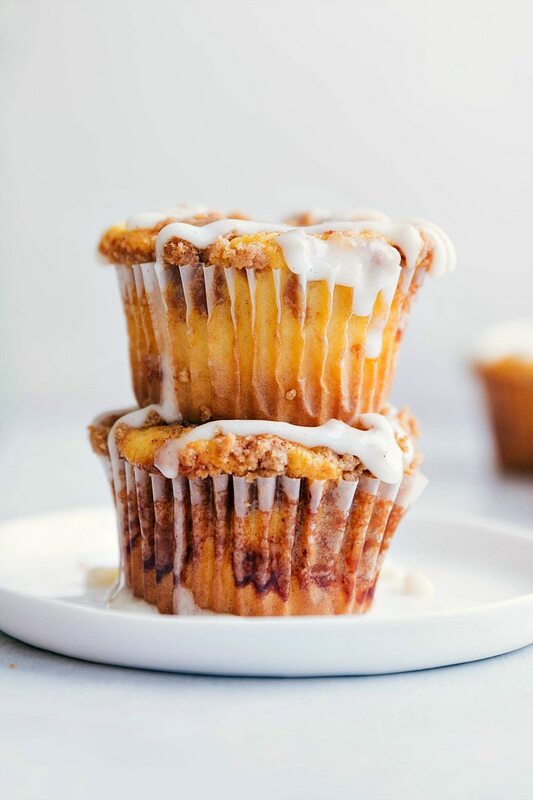 Yellow cupcakes with cinnamon-sugar swirls throughout and a sugary streusel on top. These cupcakes are drizzled with a cream cheese glaze. The base is a yellow cake mix, doctored-up to taste great. The additions are simple – oil, eggs, buttermilk, vanilla pudding, sour cream, and vanilla extract. Adding a few extra ingredients to a cake mix really jazzes it up in a simple way. These cupcakes are super moist, chewy, and have a depth of flavor you can’t get from plain cake mix cupcakes. Cinnamon, brown sugar, butter, and a tad bit of flour get mixed together to become the cinnamon-sugar swirl. That gets swirled in between the layers of cake mix and on top just for good measure. I did one scoop of batter, a spoonful of the cinnamon-sugar mixture swirled in, one more scoop of batter, and one more spoonful of the cinnamon-sugar mixture. And then comes the streusel. My personal favorite. This streusel will be pretty thick almost like a thick dough. I just put a few small spoonfuls of the streusel on the very top of the cupcakes and then put them in the oven. The streusel doesn’t need to cover the entire top (unless you want it to), but just put small bits of it throughout the top. Also, the streusel is totally optional. If you aren’t feeling it, definitely feel free to leave it out and nothing changes about how you bake these cupcakes. Last, but never least, comes the cream cheese glaze. 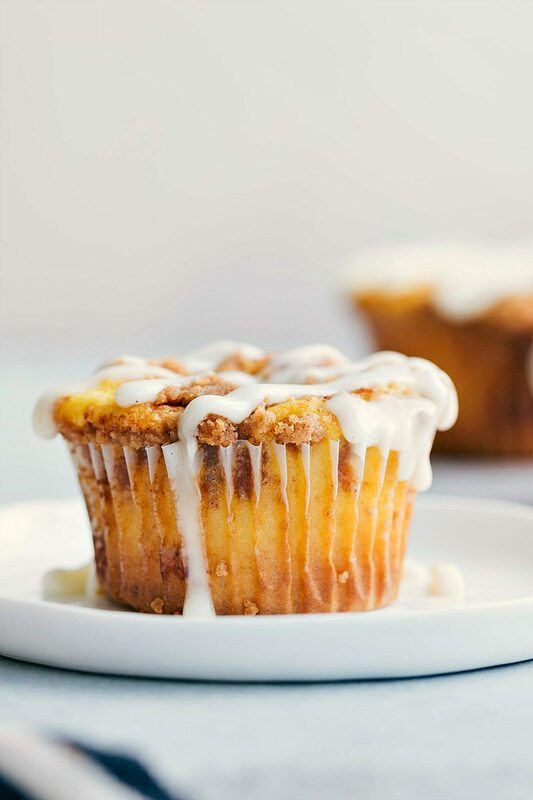 A very simple and traditional cinnamon roll glaze, and perfect for these cupcakes. You can drizzle the glaze over the cupcakes or cover the entire tops – both are great! In a large bowl, sift together the pudding and cake mix. In a separate bowl, combine the lightly beaten eggs, buttermilk, vegetable oil, sour cream, and vanilla extract. Mix. Combine the brown sugar and cinnamon in a small bowl. Stir until combined. Bake the cupcakes for 17-20 minutes or until a toothpick inserted in the center comes out clean. Let cool slightly before putting on frosting. Combine the cream cheese and butter. Using hand mixers or a stand mixer, beat until smooth. Add in the powdered sugar, vanilla, and a pinch of salt. Mix. Add in a tablespoon of heavy cream or milk until the consistency you desired is reached. Spread over the slightly cooled cupcakes either covering the tops completely or drizzling the glaze on with a spoon. If you don’t have buttermilk, combine 1 cup of milk with 1 tbsp. white vinegar in a separate cup and let sit for 5 minutes and then add to mixture. Such a fun idea! I feel the same way about my grandma’s cinnamon rolls. She has the magic touch! It’s like everyone has that special cinnamon roll maker in their life! My grama makes the BEST, but she doesn’t even have a recipe so I can’t copy it! Wah. Isn’t that the worst?! Haha and I totally agree – everyone has someone special that can make the best cinnamon rolls haha!! Thanks! These look so good! 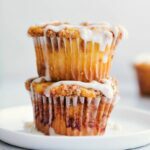 I love cinnamon rolls, and I love that these are in convenient mini muffin form! Cute! Chelsea! 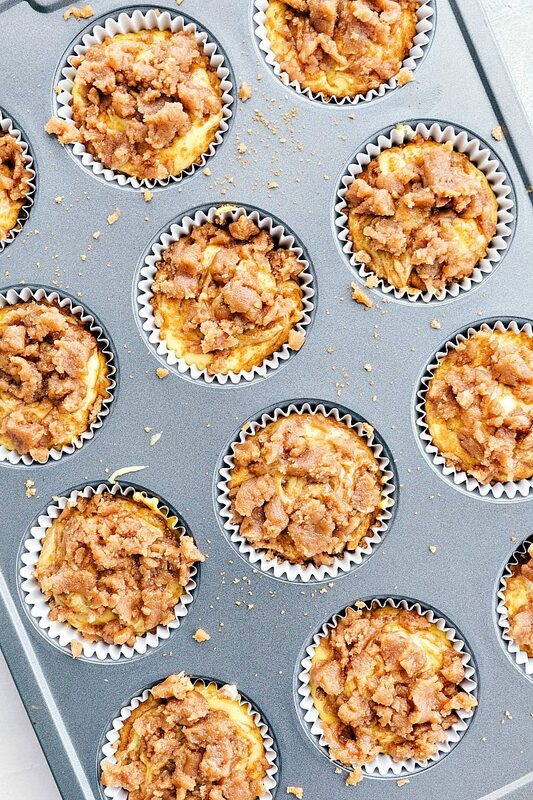 So crazy, I was thinking about making cinnamon rolls in a muffin tin this week! Send some my way girl! Oh my goodness. Two of my favorite desserts combined into one! I love this! Oh my gosh, Chelsea. There are so many amazing things about these cupcakes! I absolutely love those swirls of cinnamon! Also cinnamon swirl AND streusel? Genius. 🙂 I think I could put cream cheese glaze on anything and I love how it looks dripping down the sides of the cupcakes. Yum! Cinnamon rolls are my #1 weakness, I was just dreaming about them a few minutes ago. I totally love that you did them in cupcake form! Wooooow, these look to die for! Love the easy batter and I’m dying over the amazing streusel and CREAM CHEESE GLAZE. That deserves all caps. Because it looks so amazing! 🙂 Have a great weekend! can you believe I’ve never had a homemade cinnamon roll? I think I’m seriously missing out!! honestly I love how this recipe’s base is a basic cake mix – People want to throw shade when absolutely everything isn’t done from scratch, but I always feel like who has the time!? This is a custom recipe with a little shortcut along the way, which for me is the perfect baking balance 🙂 love! Love the cream cheese glaze! You’ve made cinnamon rolls even better by making them in cupcake form! I love all that sugar dripping off the cupcakes. They look amazing! Thank you so much! Have a great weekend Fiona! These look incredible Chelsea! I love homemade cinnamon rolls but there are days I really don’t want to put in the effort or time and these cupcakes sound perfect! Oh boy, totally loving that glaze and streusel – looks heavenly girl! Love these! You’ve taken my favorite breakfast treat and turned it into a delicious cupcake, yummy! These cupcakes sound so good!! 🙂 The glaze is the perfect touch! 🙂 Pinned!! Thanks so much for the pine Jocelyn! I hope you are having a great weekend 🙂 PS totally stalking you on IG and you and your hubby are SO cute! 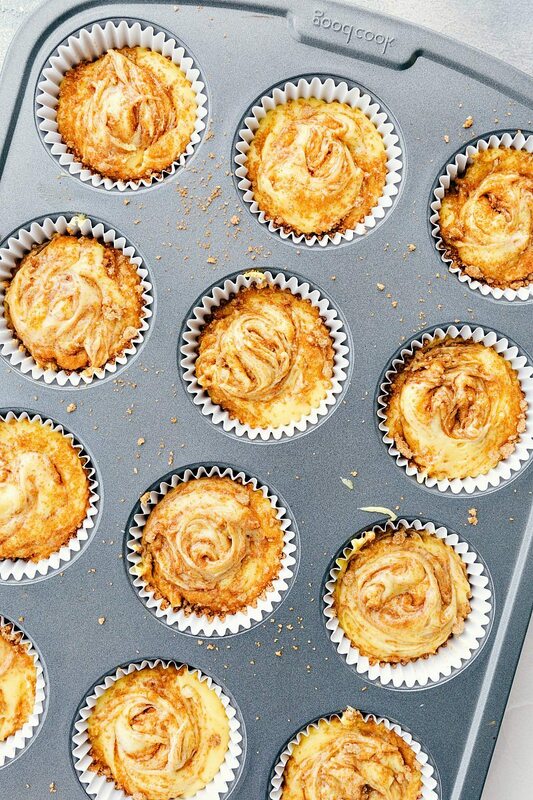 This looks like the perfect blend between a cupcake and a cinnamon roll…SO delicious, Chelsea! The picture looks heavenly. Can’t wait to make them this weekend as part of our Easter brunch. The recipe calls for vanilla pudding mix. Is it instant or cook & serve? Hi, Chelsea! I made these cupcakes today for Easter breakfast and found that they might actually work better as a sheet cake. I had a great deal of streusel topping left over even though I mounded them on the cupcakes. I also halved the icing recipe. But overall these are quite delicious! Hi Chelsea. Thank you for this recipe. I made these today and they are delicious and very sweet. How can you go wrong with cream cheese frosting. Yummy!! Haha I totally agree! 🙂 Thanks so much for your comment and trying these out! Glad you loved them!